In these accounts, I have written a fair amount about the two species of island house snakes (Lamprophis- “cobra jita) that Lisette is still analyzing and a bit on the supposedly introduced cobra on São Tomé (Naja melanoleuca – “cobra preta”); I have also mentioned the fact that each island also has a diurnal green snake, endemic but unrelated to each other (Hapsidophrys principis, Philothamnus thomensis –“cobra sua sua”. However, there are three additional snakes that I have not mentioned much: these are the so-called blind- or worm snakes. 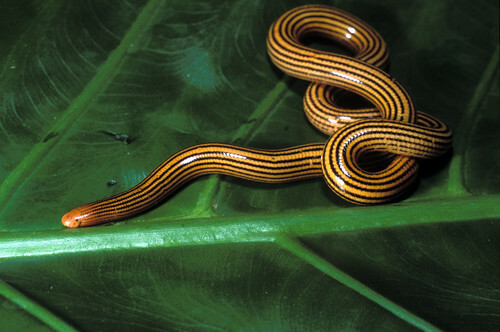 Collectively, their technical name is the Scolecophidia, and the group is considered primitive relative to other snakes. As their common names imply, all have reduced or no vision, virtually all of them are burrowers; they are small as snakes go and blunt at both ends, and there are about 300 species in three families found world-wide in tropical and many subtropical regions. 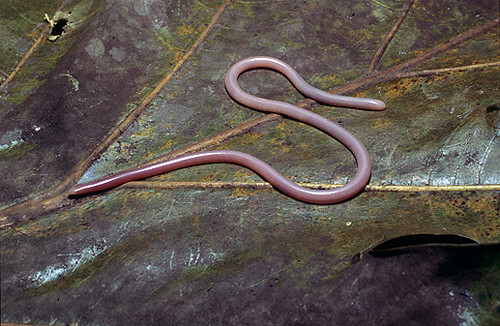 The fact that they are burrowers (fossorial), like the endemic São Tomé caecilian, Schistometopum thomense –“ cobra bobo”, lends credence to our 2007 hypothesis that some of the Gulf of Guinea endemics were carried to the islands from mainland Africa on very large floating chunks of riverbank from either the Niger or the Congo. 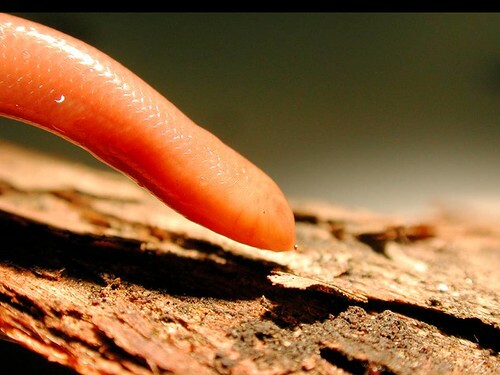 Burrowing legless vertebrates are unlikely to be found floating on logs or being carried by high winds! 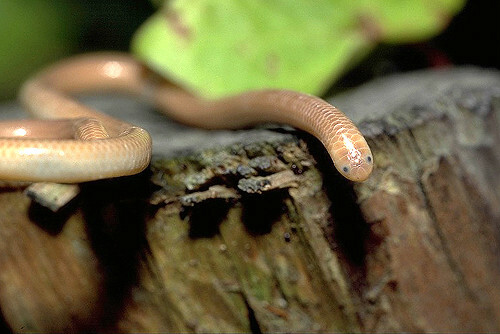 There are three endemic blindsnakes on the oceanic Gulf of Guinea Islands: The beatiful golden blindsnake, Typhlops elegans is endemic to Príncipe island. 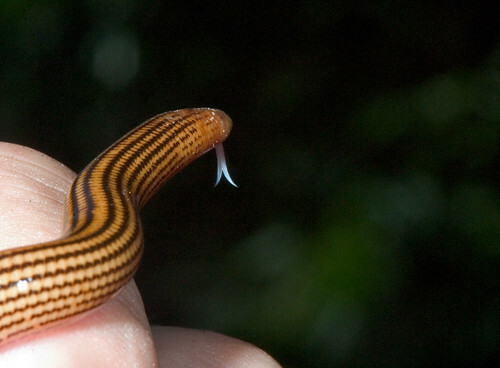 It is often confused by locals with the São Tomé burrowing caecilian, as its Kreo name implies: “cobra bobo do Príncipe. Two endemic blindsnakes inhabit São Tomé exclusively, and as you can see they are extremely similar in appearance. The reason I have not written much about them is that they are rather poorly known. Most species are small and difficult to work with, in that the characteristics that might serve to distinguish them are also very small and nearly impossible to discern without magnification. My colleague, Dr. Van Wallach, of Harvard University is probably the current world authority on these wormlike snakes, and it has taken much of his career to understand them; many of the characteristics he has studied are internal. This is not as complicated as it may seem although it will be difficult to read at low resolution. As with other cladograms, each of the names on the far right column represents a single species clustered with its nearest relative(s); thus it is a “picture” of proposed evolutionary relationships. This figure also contains estimates of when each lineage and its nearest relative split from their common ancestor (time divergence)—the common ancestor is indicated by a black dot (node) and the length of each branch linking two species is an indication of time. Actual time in millions of years is given on the very bottom, along with the names of the geologic periods in vertical colored bars (blue= Jurassic; light green = early and late Cretaceous (K); orange = Paleogene, and yellow, the most recent = Neogene). The authors have also provided diagrams (upper left) of the relative positions of the continents during the breakup of Gondwanaland. 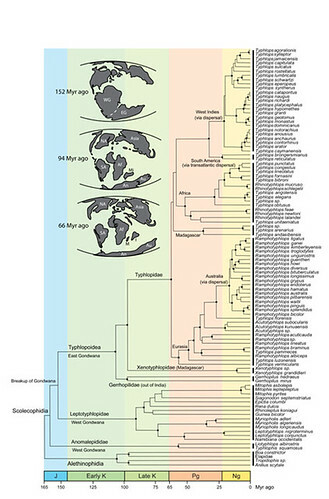 The major points of this study are (1) that the common ancestor of all scolecophidians dates back 150 million years to the Jurassic Period (before the breakup of Gondwanaland), (2) that the ancestor of the modern Typhlopidae originally existed on an early landmass the authors call Indigascar (Madagacar + India) back in the Late Cretaceous, and (3) that the presence of their modern relatives in South America, Australia and the West Indies is most likely the result of a number of overwater dispersal events (like rafting), including a major western transatlantic one. Vidal and the other authors included samples of the Gulf of Guinea Islands endemics which we collected during GG I and GG II, and their results are of great interest to us as we try to understand the origins of the Gulf of Guinea Islands biodiversity. 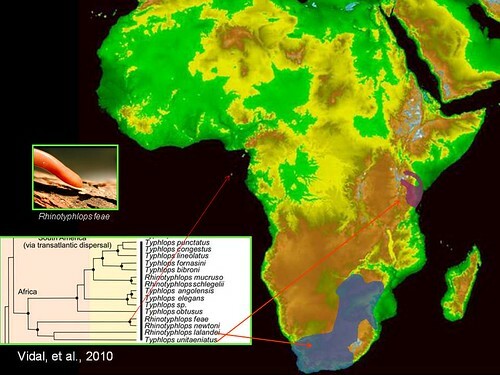 Expanded view of African clade from Vidal et al. Principe species in blue; Sao Tome species in red. Distribution of the two Sao Tome wormsnakes and nearest relatives. 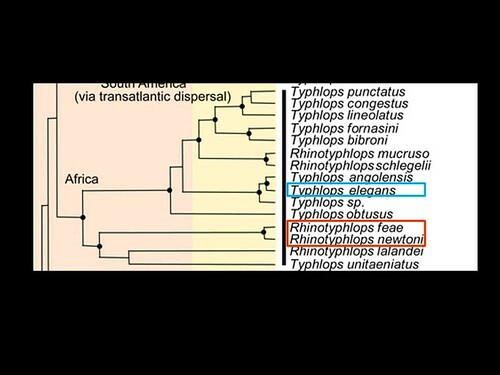 Here is the disjunct pattern that has frequently appeared when we look at the evolutionary relationships between Gulf of Guinea island endemics and their African mainland relatives; first, note that Rhinotyphlops newtoni and R. feae appear to have diverged from their common ancestor only a few million years ago. Since, the minimum age of São Tomé is regarded as about 13 million years, it seems likely that this split occurred on the island, possibly as a result of volcanic events which isolated two populations of the ancestor from each other. This is a more likely scenario than separate colonization events from the mainland. However, the nearest relatives of the island species are a clade (sister-group) comprising R. unitaeniatus of East Africa and R. lalandei of southern Africa, and a look at the branch lengths of this sister-relationship suggests that, if the time divergence estimates in this publication are correct, the common ancestor of both groups existed on the mainland over 50 million years ago. Distribution of Principe wormsnake and its nearest relatives. The situation with the beautiful Príncipe endemic, Typlops elegans is somewhat unclear, since the true distribution of its nearest relative, T. angolensis, is not known with certainty; the latter is said to occur from coastal Cameroon, south to Gabon and Angola and west to western Kenya, but these specimens have never been systematically examined. Moreover, African distributions as broad as this one frequently turn out to be made up of the distributions a number of similar “cryptic” species. 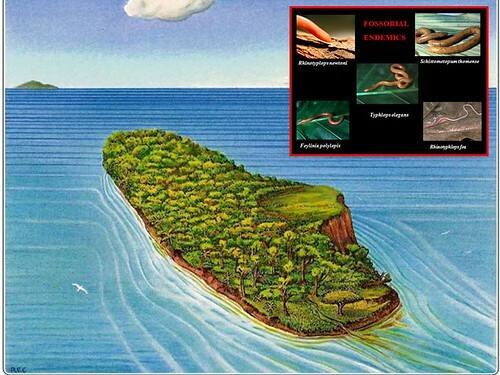 But assuming that T. angolensis does have this distribution, that the tree is accurate, and the time divergences therein are reasonable estimates, one would naturally conclude that the ancestor of “cobra bobo do Príncipe“ reached that island and diverged from mainland T. angolensis during the past few million years. If branch lengths are accurate it would appear this happened at roughly the same time as the two São Tomé endemics were diverging from their common ancestor. Even though Príncipe, at 31 million years, is more than twice as old as São Tomé is geologically, this is not an unreasonable hypothesis. 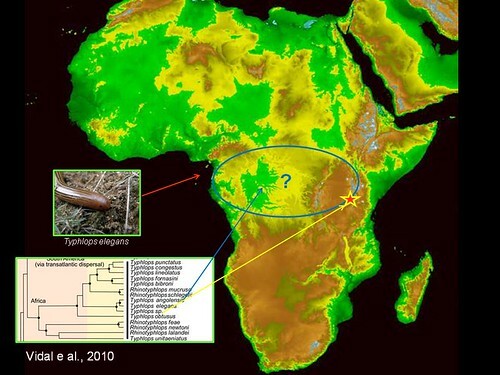 This cladogram also suggests that these two blindsnakes share common ancestry with an unidentified species (specimen) collected at Lwiro, Democratic Republic of the Congo. 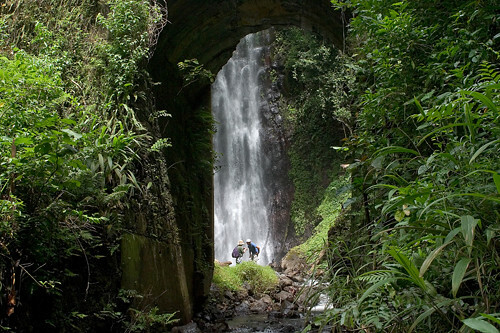 This interests us because this locality is close to the Itombwe Highlands, which are, geologically, very, very old, dating back to the Mesozoic. On a different tangent, our island biodiversity posters are nearing completion, and that will be my next topic.